In last night's episode our favorite contestant was voted off the CBS prime time program -- GREATEST AMERICAN DOG. 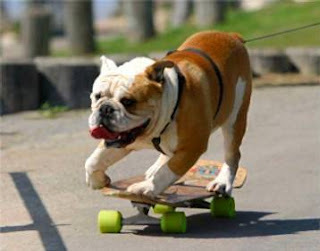 The entire staff at Needtovent mourns the untimely exit of Tilman, skateboarder extraordinaire, whose personality personifies what we most admire in man's best friend. This egregious decision by the not-so-esteemed panel of judges should not go unpunished. For Wendy Diamond and Victoria Stilwell we can only dream that some day they will suffer incarceration under the reincarnation of Ilsa, She-Wolf of the SS. As Darryl Royal once said, these offending officials will quickly learn the difference between "come here and sic 'em." And as for the third judge, Mr. Allan Reznick, a little pooper-scooper time with Scooter Libby is definitely in order. 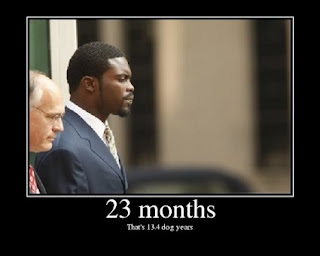 Unless, of course, he could be VapoRubbed by Sir Michael Vick. Yes, Tilman's banishment is a severe loss and the show's ratings may very well suffer -- especially in and around Athens, Georgia. However, given the free time he now has, maybe Tilman should be added to "The Short List" of current Vice Presidential Candidates. According to Needtovent's prized, professional pundit panel of political vetters and dog racing bettors, the current Short List for two of the primary Presidential candidates include Hillary Clinton, John Edwards, Wesley Clark, and Evan Bayh on the one hand (the left hand) and Mutt (or is it Mitt? or Moot?) Romney, Bobby Jindal, Condoleezza Rice, Michael Bloomberg and Tim Pawlenty on the other hand. That's pawlenty of "dogs" already in the running -- why not add one more? It should be noted that Bob Barr has already selected his V.P. running mate, Wayne Allyn Root. Once again, the Libertarian Party is way out in front of the elephant and the donkey.